of breath and had extensive negative pulmonary and cardiac work up. I had her stop taking the OCPs and her symptoms completely resolved. Now, she again wants fewer, lighter menses. What are her best options? She does not smoke and has no history of blood clots. Has she considered a Mirena IUD?Women bleed about 95% less after a year on Mirena although there may be lots of days of spotting at the beginning. Mirena will not help her acne, of course. To learn more about the advantages and disadvantages of oral contraceptive pills and the Mirena IUD, go to: www.managingcontraception.com and click on Choices 2013 edition. You can also order this wonderful new educational book from our website or by calling 404-875-5001. Do you have your copy yet? 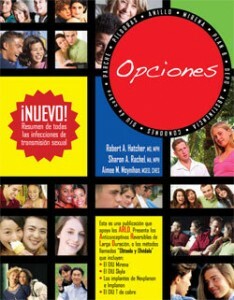 It is now available in English and Spanish.